Aliens Playing Under the Full Moon at Death Valley’s Racetrack Playa? Are there extraterrestrials living among us on earth? What do they do? These are the type of questions humans have debated for ages, and after a weekend at Death Valley National Park, I believe I am ready to solve them. Speculate no more, as aliens are playful creatures who, it turns out, live in the mountains around The Racetrack Playa and come out every full moon to move around rocks. Why you might ask, would aliens do this when there are so many things they could see and do on earth? The answer is simple: to mess with tourists. It’s probably a higher calling on their planets. 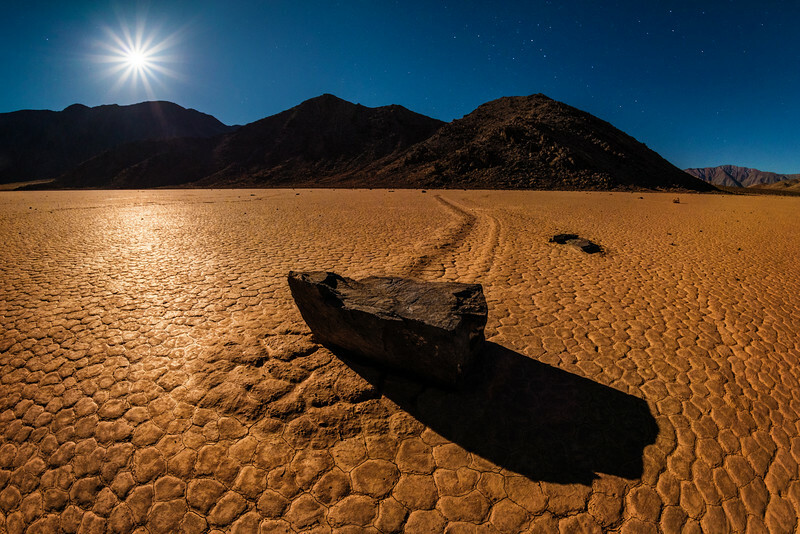 As the legend goes, no one has ever seen these rocks in Death Valley National Park move. Nonsense. As the hit film Men in Black taught us, aliens have the power to erase our minds. Heck, there’s a good chance I saw aliens the night I took this photo. I don’t remember seeing them, but I cannot say definitively that I did not see them. You might say there are other more scientifically valid explanations for why the rocks at The Racetrack Playa move, despite some being hundreds of pounds, leaving trails behind them on the playa. Whoa there, Bill Nye, ease up on the “S” word. I have plenty of rocks in my yard and they never move around on their own. Science: refuted. As ridiculous as this all sounds–and it does sound pretty ridiculous–this line of thinking (minus the tinge of sarcasm) was what was going through my mind as I shot at The Racetrack Playa, a remote area in Death Valley National Park, under the light of the full moon. I was by myself and hadn’t seen another person in hours, and I looked around and saw a really bright glow from the full moon on the mountains behind me. Then, I started thinking about all of the theories that could explain why the rocks move. After a bit of this, my imagination got the best of me and I started thinking about some crazier “explanations.” Mind you, I wasn’t actually believing any of these crazy explanations, but once you go down that rabbit hole, you start to psych yourself out a bit. (I hope at least some of you are nodding in agreement and not thinking I’m totally crazy.) This didn’t stop me from spending several hours at Racetrack Playa, and I had an amazing time out there, but it still managed to spook me out a tad. Shooting this location under the light of a full moon has been on my photography “bucket list” for a few years now. Before the mystery of the rocks was solved last year (or so ‘science’ wants us to believe–I think it would be ignorant to overlook my aliens theory just because there’s definitive scientific proof to the contrary…isn’t science all about disbelief? 😉 ), I was really intrigued by the various theories as to why the rocks moved. I thought the scene would make for a gorgeous photo, with the night sky and shadow from the full moon juxtaposed nicely against the rocks, their bizarre trails, and the golden glow of the playa. At the same time, I had read just how difficult this location is to reach, and thought it was unlikely I’d ever make it happen. After finally visiting Death Valley National Park earlier in the year, I was determined to capture this scene, but plans for a prior full moon fell through. It was looking like the same would happen this time, which might potentially put this shot off until the fall or next year. Not wanting to wait any longer, and going against my better judgment, I loaded up a Jeep and headed out by myself. I arrived just before sunset shot at The Racetrack for hours, and then camped out overnight near the playa. I’ll have plenty more to share about the experience in future posts, but I was pretty excited about the trip and wanted to share something as soon as I got back. In the end, if there were to be a crazy theory that I’d buy, it would be that friendly gremlins (my imagination pictures them as looking like Gizmo) moved the rocks around as their own, harmless brand of mischief. Call me a hapless romantic, but I am hopeful that intelligent extraterrestrial life, if out there, is spending time pursuing more worthy endeavors. What about you: have any crazy excellent theories to explain how these rocks move? I have a few of my own to share, but I’ll wait until some of you post some ideas so I don’t sound quite so ridiculous all at once. Let’s not let science get in the way of a good time in coming up with “real” explanations–it hasn’t stopped humans before, so why start now? If you’re planning a California road trip or vacation, check out my California category of posts for other things to see and do. To get some more Death National Park photo ideas, check out my Death Valley National Park Photo Gallery, which includes additional shots I have taken on my visits there. For photo licensing inquires, please contact me. Have you visited The Racetrack at Death Valley National Park? Want to go? Have any theories to contribute to the “science” on this? Share your thoughts on this or anything else, or questions you have in the comments! https://www.travelcaffeine.com/wp-content/uploads/2015/03/D75_2974-as-Smart-Object-1-copy.jpg 1335 2000 Tom Bricker https://www.travelcaffeine.com/wp-content/uploads/2017/08/logo.jpg Tom Bricker2015-03-08 15:14:552015-03-08 15:20:11Aliens Playing Under the Full Moon at Death Valley's Racetrack Playa? This is on my bucket list too. Question – did you rent a Jeep from Farabee’s? I looked into doing this last year but I didn’t have time. Did you just rent it for the day? Or did you have a Jeep the whole time for your trip? Working out all the logistics to get out here is tough — I, myself, own a Jeep, but I live in Minnesota and driving out to Death Valley isn’t the best use of my limited vacation time, so flying/renting a car is the only option. No, I did not get a Jeep from Farabee’s; I had one the entire trip. They are $199/day at Farabee’s, and I wasn’t sure what their policy was keeping them overnight. I initially balked at that price, but when I add up all of my costs, I probably would have been just as well off to rent from them–if they allow returns the next morning before opening. With that said, next time I think I want to stay back at The Racetrack for more than one night, but I couldn’t justify $400. I’ll delve into the car rental issue more in my full report on this, as it is a tricky topic to tackle. I LOVE the color and texture of the racetrack! Well worth busting a tire on your way out there. Glad you were finally able to get your shot! I definitely need to head out there sooner rather than later. It’s interesting re: your comments on the moonlight. I love when I can look out my window and see the yard thanks to a full moon. I’m sure the light and landscape you described was stunning. I really want to get out there during Milky Way season. The stars (away from the moon) were surprisingly crisp despite the bright light of the moon. I can only imagine how the Milky Way looks in the summer! Did you say you went out by yourself? Fantastic image. Really makes you stand in awe and wonder. As far as theories…make they don’t look like gremlins but more like rocks? I saw the thumbbail picture in my email and wondered why a daytime shot was under a post titled under the full moon. But on the actual picture I can see the stars and the color of the sky much better. Quite pretty. Haha. Well, in fairness, I’m betting you’ve never seen a night sky quite like what I saw in Death Valley. There are 3 “International Dark Sky Park” locations in the US, with Death Valley being one. Now, when the moon is full, the sky obviously isn’t *that* dark, but the reason it’s a dark sky park is because the sky is so clear, which also impacts the effect of the moonlight. It was really bright, like sunlight hitting the mountains behind me. When I saw that…it was a bit startling. I’m not saying I actually thought something paranormal was going on, just that my imagination started churning while I was between exposures.